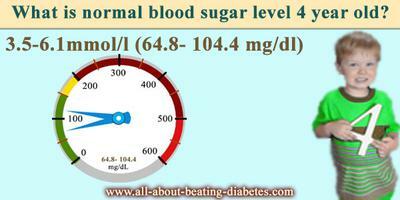 What is normal blood sugar level 4 year old? QUESTION: I want to know what the normal blood sugar level of a 4 year old is? There are several differences between the metabolism of an adult and a child, one of which s is the speed. 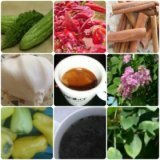 You have to know that children are having rapid metabolism because of their growth. Therefore, they are metabolizing the glucose very quick, explaining why they can eat up to 5-6 times a day. However, keep in mind that there is no difference between the blood glucose level in adults and children. I will remind you that the normal blood glucose is between 3.5-6.1mmol/l (64.8- 104.4 mg/dl), depending on the unit of measurement. So, hypoglycemia is observed when the blood glucose concentration is lower than 3.5mmol/l (64.8 mg/dl); while hyperglycemia is observed when the amount of glucose in the organism is higher than 6.1mmol/l (104.4mg/dl), respectively. Now, because of the fast children metabolism, some of the doctors are taking 7 mmol/l as the highest level; while 2.5 mmol/l as the lowest level. These values are acceptable, when the child, under the age of 12, is in critical condition - post operative period for example, and not used on healthy children and all the pediatrics are using those mentioned above. If you have any doubts about the blood glucose level of your children and eventual diabetes development, you have to know that there are early symptoms of diabetes and they are: drinking too much water, eating a lot and urinating several times during the day, large amounts of urine. If you notice some of these symptoms you are obligate to inform your doctor, and make an appointment with him immediately. The blood tests are going to show if there are any changes in the blood glucose level of your children.